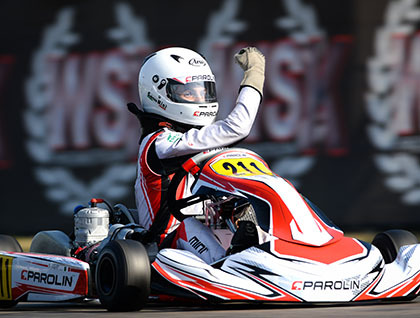 The Parolin Racing Team’s Junior drivers had to face the harshness of racing. Martinius Stenshorne and Brando Badoer both finished in 3rd place in their Prefinals, after much effort in the heats. The last race was not the easiest to negotiate. Only Badoer managed to confirm in 8th position while Stenshorne was delayed in a collision at the start. To finish 18th in these conditions remains an impressive feat. 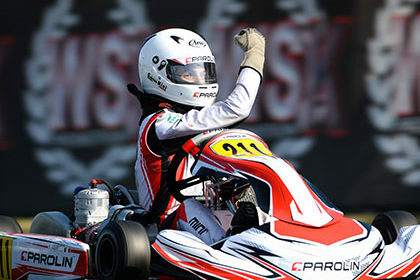 Not spared by problems, Alessandro Cenedese ended on a positive note by gaining 12 positions in this Final. The race was no easier in 60 Mini. Rashid Al Dhaheri was initially held up by two competitors with problems ahead of him in Qualifying. Expecting to take pole position, he had to settle for 20th. Rashid then retired in two heats but still managed to move up to 12th in the Final and take 2nd in the WSK Super Master standings. Keanu Al Azhari was no better off with his 28th time, but he had a series of very good races with three fastest laps. He finished well in 8th place, again with the fastest lap. The incredible recovery by Giovanni Trentin, from 59th to 11th, completed a very positive picture for Parolin. The Italian brand could indeed congratulate itself on seeing in 60 Mini its products to take pole position, seven places among the top 10 of the heats, victory in the two Prefinals and seven places in the top eight of the Final, including the three fastest laps of the race. At La Conca, the Parolin Racing Team took its fifth podium of the season.